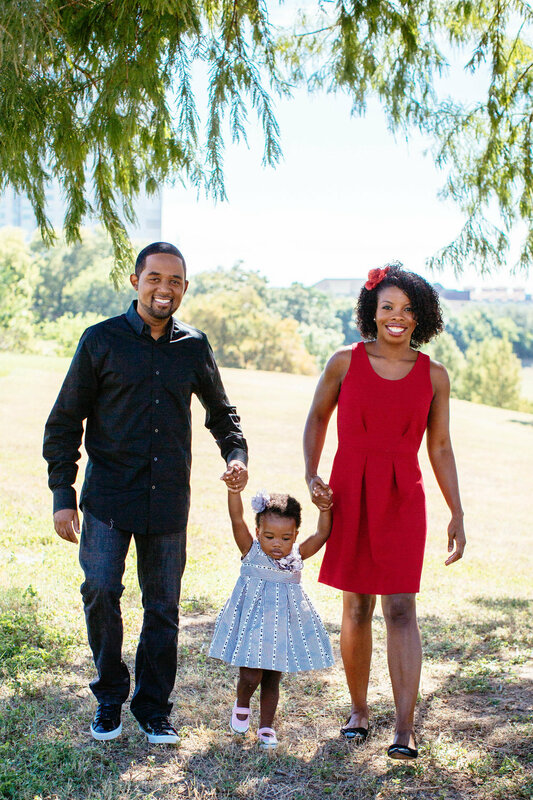 Ameerah and Chad Saine have been together for over a decade and continue to build one another up as they grow in marriage. Ameerah is an entrepreneur and founder of Brunch and Slay, and Chad Saine works with telecoms and IT in the operations field. Brunch and Slay is a lifestyle platform for women with a “live your best life” focus. They create courses, content, and experiences to help women build and win. Chad couldn't be more proud of Ameerah. Together, they are devoted to their marriage and being loving parents to their beautiful daughter. While they have been together for over ten years, they are still learning from each other and growing in their relationship every single day. From loving the small things about each other to balancing out work and family, Ameerah and Chad continue to build their love for one another in even the simplest ways. They met 14 years ago in San Antonio through the military. They were stationed there at Lackland Air Force Base. They dated for two years, were engaged for eight months, and have been married for ten years. 1. When was the moment you realized the other person was somebody you wanted to be with forever? Ameerah: There isn’t an exact moment. I think it was just a number of actions instead and qualities that he possesses for me. He has just really made life easier in a good way. Not necessarily because he took care of me or anything crazy like that, but because he got me. He was my partner. He really wanted to make sure I succeeded and he supported me. From the time we started dating, really there was no looking back. Chad: Yeah, it was organic. I just knew that she’s the one I want to be with and no matter what, I was going to make it work. I mean it’s been awesome. I want to be her cheerleader. 2. What are some of your favorite things about each other? A: I love that he doesn’t excite easily. It takes a lot to get handwork done. Like he never raises his voice, he never goes over the top. He’s just 100% chill. What I really really love about him is how much he loves his family. Not just me and our daughter, but like his core family; his parents, his aunts, uncles, his cousins. C: I think what stood out for me for her and what I definitely love the most is just how driven she is, how dedicated she is and how she’s able to actually balance so many different things and wear so many different hats almost simultaneously. I’m always kind of awestruck because my brain is kind of one track behind it when it comes to things. 3. What is something you wish you knew when you first started dating or first got married? A: I think I wish I had known that you still need to stay focused on you, to know that you don’t need to try to change him, you don’t need to try to focus on who he’s going to become. Focus on who you’re going to become. Keep yourself first and it will evolve the way it’s supposed to evolve. C: Just continue to grow and just don’t get complacent. Don’t get hung up on what’s happening, and always strive for more. 4. What’s a characteristic or trait in each other that you hope your daughter carries forward? C: If she’s able to wear as many hats as this lady here we’re both going to vote for her for president. She’s going to be a rock star. I think just being in touch with family and just being open and honest with people. A: He talks about me kind of being a magnet for people but he has a way of making people feel special. I hope that she can have that kind of connection with people where she’s really tapped in when she’s talking to people. He remembers their names, he remembers details. 5. What is your advice on supporting your spouse to pursue their passions? C: Definitely just always be a cheerleader, always be that person in their corner, their rock, because there is going to be a time where someone isn’t. 6. What are some boundaries you have implemented in your relationship that has strengthened it? A: For me, I typically turn my phone on “Do Not Disturb” at 8 o’clock. We’ve always had a time of day where we sat down and looked at each other in the face and just really talked about our day whether it was cocktails or whatever over dinner. We’ve always had that end of the day checking. So I think it’s really important to just kind of turn off the world. 7. What something that the other person does for you that makes you feel loved? C: I’d say like-- just the surprises, really. You know that’s very thoughtful. It’s not something that's a cliché. For instance, like you know just your typical card and balloon. If it is a card, there is something personal within it. A: I like the little things, so you know cleaning the kitchen or doing the laundry and I don’t have to ask. No. perfect example. He’s laughing, but last weekend I had some girlfriends in town. I was getting ready to take them back and send them off. My car was loaded down because I had an event on Sunday and I don’t even have to ask him. I go out and looked outside to get something out of the car and he’s already loading up the car with their things, taking all the things out from our party and I didn’t have to ask. I know a lot of women literally had to twist their husband’s arms to do anything extra but I never had to give him that for any other extra stuff. All those little things, he’s literally always on it. 8. What is the best relationship advice you could ever give somebody? C: Keep other people out of your business, that would be my advice to couples because the thing is at the end of the day you and your mate have to bear the burden, or I say burden, but basically have to carry that weight of your relationship. And so, if you start sharing it with other folks some of those problems, they never go away. They end up talking about the problems and bring them back up to you and never forgot about them for that matter. Number two I would say is space. Definitely, have space. A: I always tell my girlfriends or women I know who get married: You know it’s way more lighthearted. One, always wear something different every day. When he comes home, you should not be wearing the same pajamas or whatever you had on three days in a row. Even if they don't notice that it's different, they would notice if they saw you in that same nightshirt every day. And then second, I would say just sleep naked often. You can’t be mad at people if they are naked. 9. Tell us about Brunch and Slay. A. Yeah. Brunch and Slay, it's crazy how it started. It really was out of necessity. It was very selfish on my part because I had moved three times for work and never could find genuine connections. I would meet people or meet women, but it was always so superficial. If I even went networking. I would try and work to build a business. I had four which was an event planning business and it was always just like stop at the door. No one will let you in. I thought “What if I created really cool events because I like to go out.” And events they will maybe attract women who like the things I like and make it just really fun. So, I decided to just throw a brunch and see how it went. It went really well. From there, people wanted more so it kind of took on a life of its own. I still haven’t totally figured out everything about it yet because every month I get introduced to somebody new and cool and I get another idea. But I try to stay focused. My main goal really honestly is to keep curating lifestyle events for women that brings value to their day. I enjoy every time I see women connect at these events. Even last Sunday, these two girls literally became sisters like they had so much in common they were like crying “Oh my gosh.” It was crazy. I've never seen anything like it but it excites me to see genuine connections of people who feel like “Hey, I think we can work together.” And you actually get to know them there. It's not just I’m handing you a business card. Then now the content part of it where I’m creating the media part of the company, that's really cool because I never wanted to blog but I realize now it's necessary but it's cool. I'm learning from that too. I literally have embarked on a whole new area of business and industry that I never even knew really existed. I didn't know a lot about blogs. I’ve never really written blogs. I didn’t follow a lot of people on the internet. I didn’t do any of this so now I'm totally submerged in it and learning more about it every day and I really love it. 10. Do you have any advice on supporting your spouse to pursue their passions? C: I would say I mean just get out the way, honestly. Definitely just always be a cheerleader, always be that person in their corner, their rock because there is going to be times where someone isn't. Like she said, she had to go get some stuff out in the car, get prepped for the next event. Well, if I’m not attentive or if I’m not listening or if I’m not paying attention then that will add a strain on her come the time when she gets home. Like “Oh man, I have this crazy long day because not only did I have this sort of event to organize, I had to load up the car too. I mean anything I can take away from her load. That's really awesome. And then what about for you, Ameera? What’s something that your husband's done that has been really supportive or meant a lot to you? For perspective, if you were to give somebody else advice on supporting their spouse, what would you say it's been super helpful that your husband has done for you? That was the moment that I really knew I probably was on to something was when I thought “Okay, I'm thinking about maybe filing or returning back to sales and I can do Brunch and Slay in my spare time. He was like “No. You're going to keep doing this because you're on to something.” And that was like major for me. Knowing that he's not just my cheerleader but he believes in me and believes that I'm capable, that means a lot. Even if he doesn’t understand the world or care anything about it, or about girl power – he cares about girl power.